A simple-to-use, handheld MADI monitor/analyser: permits rapid on-site checking of MADI signal integrity, plus mono audio monitoring of any audio channel or channel pair. Compatible with all MADI standards, including S/MUX. 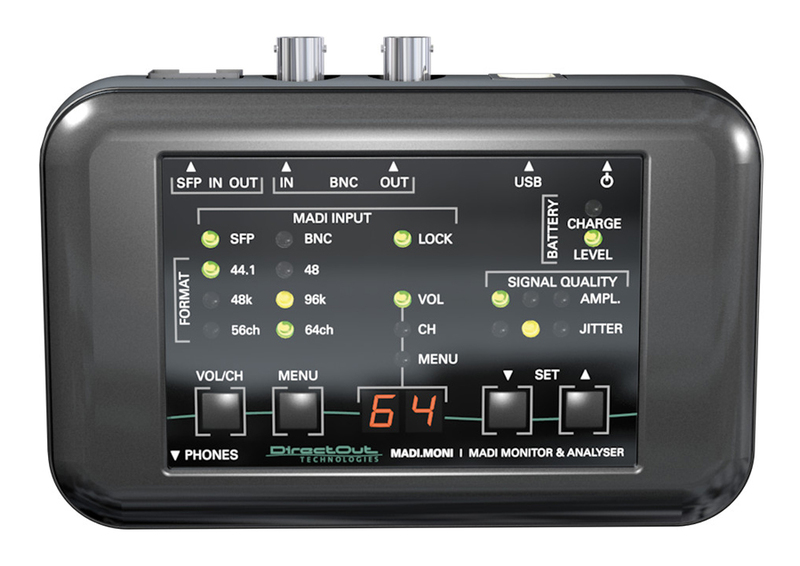 DirectOut’s ANNA-LISA is a handheld MADI analyser/generator providing a more detailed signal analysis; MA2CHBOX.XL is a compact desktop unit that permits any two audio channels of a MADI signal to be monitored via headphones or external speakers. MADI.MONI is an extremely compact MADI monitor/analyser, allowing engineers to rapidly check the “go/no-go” status of MADI signals of any type (including S/MUX), and to monitor any audio channel or pair of channels on headphones. It is an essential tool for broadcast facilities, OB vehicles, theatres, live sound engineers and product development labs. MADI.MONI accepts MADI signals in either coaxial form via a BNC socket, or optically via a suitable SFP cartridge. An empty SFP carrier is provided, into which may be fitted any compatible optical receiver or transceiver, to suit the fibre standards in use. Suitable manufacturer-approved DDM (Digital Diagnostics Monitoring)-capable cartridges – enabling analysis of the optical signal – may be specified at the time of order. All MADI formats are supported – 56 or 64 channels and 48 or 96 kHz frame rates – with auto-detection. Sample rates supported are 32, 44.1, 46, 88.2, 96, 176.4 and 192 kHz. Operation of the analyser is essentially automatic: LEDs on the unit confirm the format of the MADI signal in terms of channel count (56 or 64 channels), frame rate (48 or 96 kHz) and base sample rate (44.1 or 48 kHz). Two sets of “traffic-lights” (red, yellow and green LEDs) indicate the amplitude and jitter of the incoming signal as “no-go”, “marginal” or “go” respectively. Two further LEDs confirm the input port in use. Control of MADI.MONI is very simple, using four push buttons: one toggles between volume setting and channel selection modes, two SET buttons scroll up and down through volume levels or channel numbers; the MENU buttons allows access to various device settings, including input and output selection, mono/stereo operation and scaling factor. Any audio channel in the MADI stream may be selected for monitoring on a pair of headphones connected to the 3.5 mm jack socket on the front of the unit; the channel number (the odd channel of a pair if stereo monitoring is active) is displayed on the 7-segment LED display. This also confirms the unit’s various settings as the menu is navigated or the volume is adjusted. When no adjustment or selection is being made, it acts as a simple bargraph meter to five an indication of signal level. MADI.MONI is powered by an internal rechargeable battery; operating time with a fully-charged battery is typically two hours and LED indication of battery state is provided on the front panel. Recharging is via the USB port (from a USB charger), and a further LED indicates charging progress. The unit measures only 120 x 90 x 28 mm, and is thus small and light enough (approx. 200 g) to be carried in a pocket.